This series is the perfect addition to early-literacy outreach programs, libraries and schools. I Love When You Read, I Love When We Count, I Love When We Talk and I Love When We Play include interviews with librarians, teachers and curriculum experts. These literacy DVD’s are a great way to reach families with literacy information. Over 60,000 families, schools and libraries own a Tremain Media literacy DVD. Schools, libraries and literacy initiatives are eligible to receive the DVD’s now and pay later. I Love When We Play is our newest release. British Columbia's Ministry of Education will be distributing this video to each School District in BC. I Love When We Play is almost complete! Save 30% if you pre-order your DVD's. We will ship in mid-June. The Rotarian, a magazine that is delivered to every Rotary member in Canada and the United States, featured the DVD, "I Love When We Count." Very exciting news indeed! The I Love When...series becomes a part of Winnipeg Library's Early Literacy Kits. We're proud to be a part of your literacy strategy. 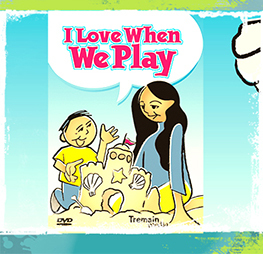 Tremain Media is proud to have Grass Roots Press as a distributor for the I Love When We... series. The newest DVD release, I Love When We Talk, is featured in Spring 2010, Ministry of Education, Early Learning Newsletter. The Sunshine Coast adopts I Love When We Count and I Love When We Talk as part of their SPARK program which focuses on the latest research on ways that parents can support their child's learning at home. I Love When We Talk will hightlight the crucial aspect caregivers and families play in literacy and speech development.